The bountiful vineyards, classic villages, and hearty cuisine of eastern France are legendary. Starting in the effervescent Champagne capital of Reims, you'll spend 14 fascinating days with your Rick Steves guide, exploring Colmar's cobbled lanes, Alsace's meandering Route du Vin, Verdun's historic battlefields, Burgundy's fabled Côte d'Or, Chamonix's majestic mountains, Provence's scenic Côtes du Rhône, and ending with a farewell toast in exquisite Aix-en-Provence. Join us for the Best of Eastern France in 14 Days! Just 45 minutes from central Paris by frequent TGV (bullet) train, the effervescent city of Reims is famous for its royal history, its towering cathedral…and Champagne. We'll meet at 5 p.m. at our hotel for a short "bienvenue à Reims" meeting. Then we'll take an orientation walk through the heart of Reims, followed by time to get acquainted over dinner together. Sleep in Reims (2 nights). No bus. Walking: light. We'll spend our morning on a walking tour through Reims' historic city center, where we'll learn about the design and history of its glorious Gothic cathedral. Rivaling Paris' Notre-Dame Cathedral in beauty and prestige, more than two dozen kings and queens of France were crowned here over the course of six centuries. The cathedral and its surrounding neighborhood were virtually destroyed during World War I, then rebuilt during the Art Deco age, which is delightfully reflected in the design and décor of Reims' downtown buildings. Today we'll also learn about this region's most famous product — Champagne — with a tasting courtesy of a local producer. Dinner will be on your own this evening. No bus. Walking: moderate. We'll meet our bus and driver today and take a short drive to the historic WWI battlefields at Verdun. We'll visit the ruins and monuments of one of Europe's costliest battles of attrition, where hundreds of thousands of French and German soldiers perished. Our day will end in France's Germanic region, the Alsace, the ultimate Franco-Germanic blend. Tonight we'll share a dinner of Alsatian specialties in the town of Colmar, where we'll sleep (3 nights). Bus: 6 hours. Walking: moderate. Today is devoted to exploring the enchanting town of Colmar. We'll take a walking tour this morning, wandering over its cobbled lanes lined with leaning, half-timbered buildings, and learn about the historic importance of the community's canals. We'll wrap things up at one of Rick's favorite museums in Europe — the Unterlinden — home to the Isenheim Altarpiece by Matthias Grünewald. You'll have this afternoon and evening free to explore more of the city's sights and pedestrian-friendly lanes, and to enjoy more Alsatian specialties on your own. No bus. Walking: moderate. Let's take off and explore the region's scenic Route du Vin, where colorful villages and vineyards carpet the foothills of the Vosges Mountains — birthplace of the region's very dry Rieslings and aromatic Gewürztraminers. Our first stop is the imposing Château du Haut-Koenigsbourg, perched sky-high in the Vosges Mountains. After lunch in a small Alsatian village, we'll wander through the vineyards and find the perfect winery to sample some local varieties. Then we'll return to Colmar, where you'll have the late afternoon and evening free. Bus: 2 hours. Walking: light. This morning we'll drive from the Teutonic tidiness of Alsace to the red-tiled villages of Burgundy and its bustling wine capital of Beaune. After some free time for lunch, we'll hit the ground walking with a tour of the town and its eye-opening medieval charity hospital, Hôtel Dieu. Tonight we'll have a Burgundian dinner together. Sleep in Beaune (2 nights). Bus: 3 hours. Walking: light. It's outdoor market day in Beaune! Your morning will be free for rubbing elbows with locals sampling smelly cheeses, creamy patés, and fresh produce while doing their weekly shopping. This afternoon we set off for Burgundy's legendary and beautiful Côte d'Or wine country, where we'll have lunch together at a local domaine, along with a tasting of its celebrated harvest. We'll return to Beaune later this afternoon, where you'll be free for discoveries and dinner on your own. Escargots, anyone? Bus: 2 hours. Walking: light. This morning we'll make a bee-line for Europe's highest point, Mont Blanc, arriving in the picturesque resort town of Chamonix in time to get acquainted with all the Alpine thrills this charming city offers. This evening we'll enjoy a traditional dinner of raclette or fondue together. Sleep in Chamonix (2 nights). Bus: 4 hours. Walking: light. Today is your day to enjoy the wonders of the French Alps. You can choose among several great hiking trails with stunning views of Mont Blanc and a supporting cast of Alps that seem to stretch forever. For one of Europe's great Alpine thrills (weather permitting), take Europe's longest vertical gondola rides up to the 12,600-foot Aiguille du Midi viewpoint. From there, mini-gondolas take travelers over the snowfields and on to Italy (and back)! No bus. Walking: light to strenuous (your choice). Sit back and rest those hiking muscles as we spend our day driving south to sunny Provence, enjoying the countryside along the way. 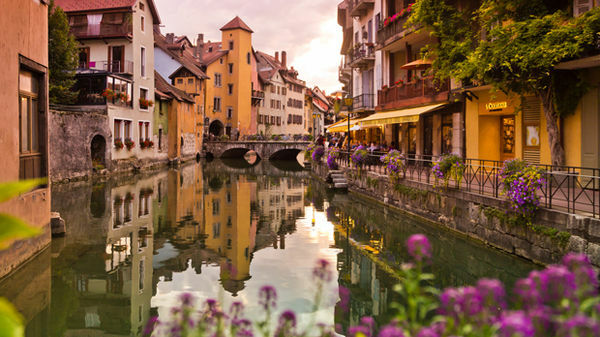 We'll stop for lunch and a boat ride (weather permitting) in exquisite Annecy — hands-down France's most beautiful lakefront town. We'll arrive at our history-rich, Provençal destination of Vaison-la-Romaine in time to get oriented and enjoy dinner together. Sleep in Vaison-la-Romaine (3 nights). Bus: 5 hours. Walking: light. We'll spend our morning sifting through the 2,000-year-old site of ancient Vaison-la-Romaine. There we'll tour the ruins of a sprawling Roman mansion and the 6,000-seat Roman theater that is still used for performances today. Consider this a warm-up act for the most impressive of all Roman theaters — the Theater of Orange — which we'll drive to and experience this afternoon. Bus: 1 hour. Walking: moderate. This morning, we'll drive through some of Europe's most picturesque villages and vineyards, as we make our way to one of our favorite wineries. We'll stop there for a refreshing lunch and the chance to sample some formidable Côtes du Rhône wines at their source. Then we'll return to Vaison for free time this afternoon. Bus: 2 hours. Walking: light. Today we'll continue south through Provence's intoxicating countryside, making our way to the affluent, artsy town of Aix-en-Provence, where we'll tour its pedestrian-friendly center with our local guide. This afternoon you'll have more time to explore the colorful lanes, shops, and galleries of Aix-en-Provence before we gather this evening to share travel memories and toast new friends at our farewell dinner together. Sleep in Aix-en-Provence (1 night). Bus: 3 hours. Walking: moderate. Breakfast is provided, but there are no group activities today. It's an easy 30-minute bus, shuttle, or taxi ride to the Marseille airport. For those staying longer, your guide will be happy to send you off in the right direction and help with any trip-planning needs. Au revoir et merci! This was our 8th tour and it was, as usual, a delightful experience. Our guide was superb and the information she provided greatly enhanced the tour. She also took good care of us. The route was interesting and the stops well chosen. "This did not seem to us to be a "wow" sort of tour. We saw cathedrals, towns, Roman ruins, a castle, the Alps, a battlefield, and four wineries. All were well worth seeing but none of them were the most spectacular or interesting places we've seen. That said, the tour was a wonderful overview of eastern France and we understand the region and its culture and economy much better than we did before. If there was any one moment that stood out, it was seeing the carnage that occurred at Verdun." This tour provided good wines and variable and beautiful landscapes. I appreciated the information about WWI and WWII which began the tour. "I felt as if I were in a dream world for most of the trip. Our picnics provided such wow moments because we shared great food and beautiful scenery. Of course, the Alps wowed this traveler since I live in flat and car congested Houston, TX." I had an extremely nice time. Truly enjoyed the rather leisurely pace. "No single moment stands out - but the entire 3 days in Colmar was just terrific." After 3 trips to Paris, I was ready to see more of France, and this tour was a terrific taste of France beyond Paris. I enjoyed all of it, but Chamonix and it's mountains, and Aix en Provence and it's connection with Cézanne were my personal favorites. Our guide, Virginie, did a great job of explaining French culture in an enjoyable way. "Arriving in Chamonix on an overcast day, and waking up the next morning to find we were surrounded by glorious mountains!" I felt well cared for and educated. The locations provided a variety of experiences and culture. "This had to be Chamonix at Mont Blanc. The clouds parted to let the late September sun make a dazzling show of the mountains. The tour through the town allowed us the independence to explore on our own." The whole trip was very interesting and enjoyable. I especially liked the way Virginie taught us French phrase and us introduced to the French culture through the make believe family. The sounds, sights and tastes through the tour immersed in everyday life in France. "There were 2. Mount Blanc and the WW1 bunker at the battlefield of Verdun. The first was spectacular and beautiful and the second was stark, emotional and educational." I loved everything about this tour. It was a part of France that I had never been to. The places we visited were all so different and yet so French! I enjoyed the historic nature of the towns and also the winery visits. The tour included a good mix of both. Our guide, Toni, was wonderful and really enhanced the trip. "It's hard to pick a favorite, but I have to say that our tour and luncheon at the Mourchon winery were very special. Kate, the owner's daughter gave the best tour of this type that I have ever had. She was very knowledgeable about the vineyards and the winemaking process and she was able to convey her information in a way that was eminently understandable without being "dumbed down". The buffet luncheon was the piece de resistance. An idyllic setting on a beautiful day. Ooh la la!" We have been to France many times but never to this Eastern area. We wanted to experience the culture and history of this area and we were not disappointed. A great deal of French culture is defined by the enjoyment of food and wine and this tour more than provided satisfying experiences. Our guide Toni, with her 30 years of living in France, made our tour informative and well organized. The pace of the tour was leisurely with plenty of individual time. "Two stand out. Number one was our visit to Domaine de Mourchon vineyard in the the Cote du Rhone on a perfect day. The owners daughter, Kate, gave the best, clearest and most understandable wine making presentation I have ever experienced. We then adjourned to a fabulous fresh lunch under shade trees with a beautiful vista of the countryside. It just doesn't get better than that. The other experience was much the same with a picnic lunch at the ancient Chateau de Rully outside of Beaune." The tour delivered all we had hoped for and more at unexpected moments. The changes in venues were acceptable although a smaller Champagne producer would have been ideal. The theater in Orange was covered in scaffolding. Perhaps Pont du Gard would have given a better experience for Roman culture. The planed meals were excellent and adequate proportions. The many wine opportunities were extraordinary. Some of the bottles we experienced were corked and were discretely confirmed by our guide. "The visits to the small wine producers were our WOW moments. The dedication and hard work that they give to producing their wine is inspiring. Visiting the vineyards at harvest time was eye opening. Being in the vineyards tasting a variety of the left behind grapes was truly amazing." "There were no real WOW moments on this tour. Just very enjoyable experiences. Good scenery and sites. Good guide. Good travel companions. Good food. Good wine!" I thoroughly enjoyed the city orientation walks, bus rides through the French countryside and Alps. A bit disappointed in a couple of the hotel accommodations and restaurants... Our guide was very knowledgeable and proactive in preparing us for each day...including special treats to share almond the way. "Our picnic lunch following the vineyard tour and wine tasting at Domaine du Mourchon Winery was wonderful!" Overall experience was as expected, excellent. Enjoyed all the wine tastings and area's visited. This was the most laid back of the Rick Steve tours we have been on. The tour was enjoyable, no rushing, nice easy pace. I would have preferred to have at least 4 to 6 hours in Verdun. I would recommend anyone who reads history, especially, WWI, come before the tour, rent a car and go to Verdun and spend at least a day seeing the sights not covered on the tour. "The wine tasting and lunch in the vineyards of the Cotes du Rhone. Kate's tour of the vineyards, winery, lunch and her father, Walter, host of the wine tasting was the best. Always enjoy the picnic's on the RS tours. Toni did a great job on the picnic at the Count's castle." The trip was fun. The accommodations were lovely. The food delicious. "The Mourchon Winery lunch was fabulous. I was living the Provence dream under the plane trees, sipping wine and eating farm fresh food. A highlight of the trip." Beautiful scenery, charming towns, lots of wine and too much food! Definitely a tour for wine lovers. Loved the many sights, but would have liked more about the history and culture. "The two chateaux (Haute-Koenigsbourg and the Rully tour with the Count); beautiful fairy tale town of Eguisheim; the constantly changing views of the Alps and Mt. Blanc in Chamonix; sunny, lovely Provence." A manageable, educational and interesting tour packed full of new information and experiences. Beautiful and varied wine experiences from 5 different regions that covered all aspects of wine making from growing grapes to tasting the finished product. All this was paired with an array of wonderful food experiences and local accommodation. And a great group of people to spend 2 weeks with! "Hard to choose but top of the list was the WW1 tour by a local guide including the Douaumont Ossuary and the champagne caves in Reims." This tour was piggy backed into our Paris tour. I enjoyed the cities more with each stop and didn't want to leave any city especially Colmar. I loved market day in any city. The group was a great blend of people. Our bus driver, Luke was cheerful, sociable and a great driver. The local guides were top notch and I am raving about the fine lodging we had throughout our 2 weeks. I wish we could have stayed an extra day in Aix en Provence but I don't know what day we could have cut elsewhere. "Those special visits that you only get on a Rick Steves tour: a picnic lunch provided by Daniela in Chateau Rully; a tour of the winery and a lunch made by the family in the garden of the home of the winemaker at Mourchon winery in Seguret, outside of Vaison la Romaine. I instantly fell in love with the charm of little Venice in Colmar and marveled at market day in Beaune (wish we had all day). And seeing Mont Blanc from an opposite mountain we reached via gondola. Those were WOW moments." It was so nice to get back to a RS tour after 4 years (previously took 4 tours in 5 years). The trip was as expected, more relaxing without early morning departures and hustle from city to city. This is a wonderful tour for anyone wanting to learn history, architecture, art while experiencing beautiful scenery, good food, fine wine, and as usual, great group of travelers! "I loved touring the castles and chateaus, as well as walking around the smaller historic villages. The visits to the family owned wineries were all so different and much fun." The tour was a nice blend of historical sites, smaller towns and, of course, wine tasting. Daniela did a great job, and her sense of humor added quite a bit to the tour. "The Mer de Glace glacier was pretty amazing, as was the visit to Chateau Rully, an 800 year old castle/chateau/winery still in the original family. The champagne cellars at Pommery were unexpected in their size, and the amount of champagne they contained." "Standing at the top of La Flagere looking across at Mont Blanc and marveling at the continuous "dance" of clouds and sun. Still takes my breath away when I re-imagine it." Once again (for the 7th time!) we had an outstanding tour. Daniela is, of course, a gem of a tour guide. Her humor was infectious, and helped make this one of the most fun groups we've had the pleasure to travel with. The locales were superb, and the hotels were exactly the kind of quaint, fun, charming places we've come to expect on a Rick Steves Tour. "SO MANY! But one of the top moments was when the gates opened at the chateau in Rully, and we got our first view of that beautiful home. In Chamonix, seeing Mont Blanc's summit without clouds was also an awe-inspiring sight." "I enjoyed the trip up into the French alps. The dinners were truly representative of the French culture." The tour got better as it went. The French alps and Provence were high points for me of the tour. "Riding a gondola up to the Aigee Midi in the French Alps in Chamonix and watching the world sink away. Also, eating sun-warmed grapes in a vinyard high up in Provence on the last day of grape harvesting." My husband and I loved this tour. It was well-balanced--on one hand, seeing the WWII war room in Reims and then the sobering pocked WWI battlefields and underground fortress in Verdun and on the other,watching Alsation dancers perform traditional dances, seeing a 600+ year old chateau being lovingly restored by the family in Burgundy, and the majesty of the French Alps in Chamonix. "My favorite "wow" moment was stepping inside the ice-cave of Mer de Glace at Chamonix and just experiencing the scenery of the French Alps. Another was seeing the Roman Theater in Orange." Overall, I loved it. This was my 1st Rick Steves tour. I loved the guide, Virginie More, and loved the group. Everyone was compatible and we continually migrated to spend time with each tour member. I would highly recommend the Eastern France tour. "How to determine my "wow" moment... impossible! There were so many. I would have to say the stay in Chamonix. The town was exquisite. I only wish I had been physically well enough to have traversed Hike 1. The tram to the top was closed so we didn't get to enjoy that particular experience." I enjoyed every moment of the tour. I love the smaller villages, and this tour had several that we visited. This was a fabulous tour. The daily activities were fun, interesting and was everything and more that I expected on this tour. Everyone of the tour members were very kind and friendly. "The visit to Chamonix and the free day to hike the Alps and the glacier ice cave, was my WOW moment. I loved the little Venice feeling of Colmar"
I had every expectation that the trip would be great but it exceeded my high expectations - in every way. Outstanding tour leader, lovely fellow tour-ers, really wonderful itinerary, great bus driver. We lucked out on weather - rained for 20 minutes on one of the 14 days. This was not promoted as a wine tour but it could have been, particularly this time of year in six wine regions. Perfect balance of scheduled and on-our-own time. My husband and I loved every minute of it. "Too many to name, and many of them came during the Vaison La Romaine stay. If forced to pick only one, I would say the visit to Mourchon vineyards, winery, tasting and mind-flowing lunch under the plane tree. My happy memories return to that day a lot. And the first of the two cases of wine we ordered just arrived!" 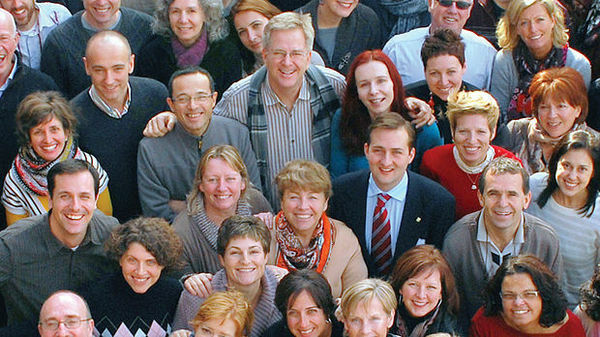 This was our first Rick Steves' tour. We didn't know exactly what to expect, but the trip surpassed all our expectations. It was so very well organized, and included a wide variety of experiences. The attention to detail was commendable. For instance, we were able to not only visit family wineries, but to go out into the vineyards and taste the various types of grapes. The tour was wonderful. It met every expectation I had. "I liked the opportunity to visit with the various winery owners such as the count at Rully and the owners of the Mouchon winery. It personalized the wine growing process. Also, seeing the glacier at Chamonix had a strong impact on me. It clearly showed the effects of global warming. Also, Verdun was quite moving-such a tremendous loss of life." This was another exceptional Rick Steves' tour that exceeded my wife and my expectations. Virginie was friendly, personable, knowledgeable and an excellent leader. "Too hard to Choose! Shopping in the market and then picnicking on the grounds of a chateau. Visiting and sample from multiple vineyards. Visiting the olive grove and art studio of Denis, the santos maker. The Pommery cellars. The provided group dinners. The chateau Kœnigsbourg." "The variety of restaurants and Hotel Le Rapp in Colmar, Le Conty (underground wine cellar) in Beaune, cooking our meal at Le Monchu in Chamonix; the amazing architecture from Roman to the present day in Reims, Colmar, Beaune, Vaison-la-Romaine and Aix-en-Province. But nature was at it's best in Chamonix and a WOW for us all"
We have been to France many times, but this trip provided new experiences every day. "I had two WOW moments: 1. Hiking through the Alps in the shadow of Mont Blanc. What a glorious day! 2. Each member of the tour was given one item to buy at the local farmer's market. It took some scouting to find the exact items, requiring everybody to to their best at communicating in French. Then that afternoon, we put all of our farmer's market purchases together and enjoyed an amazing picnic on the grounds of a 13th century chateau. WOW!" The Best of Eastern France tour was simply wonderful. This tour takes the traveler to five completely different regions, each with its own beauty and culture. The tour guide and local guides were engaging, helpful and very knowledgeable. "My favorite "wow" moment was visiting the Chateau Rully in Bourgogne. The castle was begun in the 12th century. The current occupants can trace their family back to the 14th century in this castle. After a tour of the castle, we had a picnic with delicious local food we purchased at the Saturday market in Beaune. Remarkable!" I loved this tour! We had a great guide, a great group, and wonderful weather. Visiting smaller cities and towns made for a relaxing trip and gave ample opportunity to be immersed in local culture, especially all the town markets. I found the French people to be delightful, charming, and passionate about their home. "My favorite moment was lunch in the beautiful courtyard of the Mourchon winery, taking in the views of the surrounding countryside while enjoying a fabulous meal and stimulating conversation and thinking "It just doesn't get any better than this!"." We had the trifecta. Great guide, great group, and great travel destinations. "I'm a wine guy, and so my favorite moment was the tasting at Domaine De Mourchon in the Cotes du Rhone region in Seguret. The owner's daughter gave an outstanding wine tour from vines to the wine making facilities. We were so fortunate with the timing as they were harvesting the Grenache and Syrah grapes at the time of our visit. We got to witness the grapes going up the conveyor belts, getting destemmed, crushed and onto the fermenting tanks. First time in all of my wine tours to see it all." Best RS tour yet. The itinerary was right and the guide was outstanding. "Being tasked with going to the market to make purchases for our picnic. This was fun and a bit of a challenge too." I thoroughly enjoyed the whole tour. Virginie was an excellent tour leader as she introduced to amazing towns, their residents and cultural highlights. We even learned a little French along the way although our pronunciations made the locals laugh. "Taking the Aguille de Midi cable car up the mountain and hiking down to the cog train. Breathtaking scenery!" This was our 6th RS tour and the second half of a back to back Tour experience...the first half being a City Tour of Paris. This Tour exceeded our expectations in many ways! Our guide Virginie was very knowledgeable and personable ...wonderful person to have lead us through Eastern France. The Tour was very well organized with many different experiences that included unexpected and special surprises. There was a wide variety of unique venues and experiences with true locals. "With the diversity of this Tour it's collection of "wow" moments. Several experiences with locals were very memorable! Scenery that was spectacular and can only be appreciated by being there. But if there must be one "wow" it is Chamonix Mount Blanc...and being in the Mountains." "My "wow" moment was that my fourth Rick Steves tour was just as great as the others. That this quide was just as great as the others. That this experience was just as great as the other tours." Overall it was fine. A very good itinerary. The meals were disappointing though, I was looking forward to better. Also, a couple of the hotels were particularly bad. "No "wow" moments really but I did enjoy visiting the Mourchon because of the friendliness of the proprietors and the nice lunch." I expected that this tour would focus on the wine making industry of France, but I was very pleased to see that it incorporated a lot more. Our tour included sites that are important for their cultural, historical, artistic, political, and religious significance, which made it all the more interesting for me. I have enjoyed the social aspect of each Rick Steves tour we have taken and this group of people came ready to share the experience of traveling together. It was a lot of fun. "Touring Château de Rully and listening to the history of the castle explained by the owner. I enjoyed the picnic that followed outside the castle walls with items purchased by tour members at the local city market that morning. We had a lovely view and delicious samples of French food." "The wine, of course! ;)"
Having never been on a Rick Steves'tour, I was SO impressed by the towns visited, some smaller, but each rich in history and tours to take, on our own or with our guide. The listening devices were so wonderful in that we did not have to hover over guide to hear, but could walk along listening and observing. Having fewer people on the tour made for making friends, enjoying each person. The tours taught each of us, with options for more athletic activities only if we chose. Well done!!!!! "Sorry, I cannot choose ONE favorite moment....there were so many exciting "wow" moments at each location!!!!!" Activities: Interesting and fun. Each stop had great group outings. Guide: Julie was outstanding. She communicates very well, she cares about each and every tour member and she is very knowledgeable. And her assistant Lauren was awesome as well. Food: Many of the group meals were memorable, including the picnic in Beaune, the lunch at the winery and the dinners in Colmar and Chamonix. Hotels: always the weak link in a Rick Steves tour. The room in Beaune was just plain odd. "The picnic in Beaune, which began with each tour member going shopping at the Beaune Saturday Market for a contribution to the picnic. Then after the tour of the castle in Rully, being able to picnic on the Castle grounds with an amazing amount of Burgundian Treats. Fantastic." As usual...I was very pleased with my experience. This was my 12th RS tour! After each tour I am a little bit smarter. Julie certainly made learning fun and she knew not to drown us with information. For example she covered various topics while on the bus but she also allowed us plenty of time to just "zone out" and gaze out the window at the countryside while we drove by. "Of course there were lots of wow moments but I am going to pick our visit with the Count of Chateau de Rully outside of Beaune. He gave us an entertaining tour of his castle that he shares with his young family. We concluded the tour with a wine tasting (of wines he produced) in the 12th century medieval kitchen! How cool is that? Oh...and of course there was Mount Blanc in Chamonix...up close and personal!" This was our 6th RS tour and 2nd best, next to Greece with David. We chose this tour for it's variety of terrain, as well as the distinct wine regions. Our other, but brief, experience in France was on the 21 Day Best of Europe tour, so we enjoyed the depth of our French emersion with the French people, foods, culture, and balance between country and city life. Our travels were enhanced by our quality guides, Julie and Assistant, Lauren, our capable driver (Win), and great weather! ""Wow" is too tame a description of the day we hiked from the Midi Gondola to the glacier and ice cave in t-shirts and clear skies. Ten miles and sore calves the next day, but so worth our efforts to be in shape for such a hike. Hikers were from many other countries, and always friendly. It felt like such a privilege to be on that trail. The views of the ragged cliffs and quaint Chamonix below created some very memorable moments and keepsake photos." This was another excellent tour from the RS organization, our sixth. The tour guide Julie & assistant Lauren were excellent, bus driver Wim amazing. The pace was good and the weather cooperated for the entire time. I came away with a good knowledge and feel for these regions of France: Champagne, Alsace-Lorraine, Burgundy, French Alps, and Provence. Each area was unique and had its own feel. "This is difficult because there were so many new and interesting sights. Verdun was its WWI dead was very sobering. The French Alp above Chamonix were magnificent and I enjoyed a day hike above the town. The medieval village of Vaison la Romaine was very interesting and a great place to stay. A highlight was the wine tour and luncheon at the Domaine de Mourchon vineyard. I enjoyed everything I experienced." "Balfour, Alps, and information re culture provided by tour guide." Enjoyed the tour and those individuals touring with us as well as our leaders, Julie and Lauren. Most of the sites and towns toured were interesting and of value. Felt well taken care of. "The town of Reims and Verdun battlefield; quite an emotional experience from both World Wars." Generally excellent all the way around, but suggestions for the future: 1) Too many days (4) focused on wine tasting; 2) When we were in Vaison things weren't working as people dropped out of some events; and 3) I, and I think many others, wanted more time in Chamonix. We felt rushed without a chance to do what we wanted AND this was when the upper lift to the Aguille du Midi was broken. Skip the trip to the count's chateau in Burgundy or reduce time in Vaison and add a day in Chamonix. "Unfortunately you did not tell people of the sound and light show on the facade of Reims Cathedral the weekend before the tour. We were there and it was a big "WOW" moment. Otherwide, clearly the stunning views in Chamonix." This was another wonderful tour. All the Rick Steves tours we have taken (this was number 7) have been of consistently high quality and this tour was no exception. "Our stay in Chamonix was wonderful. It helped that we had wonderful weather. The hotel was lovely with our room being right on the river. Hiking on the slopes of Mont Blanc was magical." A very good tour overall. Very glad we had the experience. Learned a lot about France. Enjoyed a lot of good food and wine. "Chamonix. I wish we could have stayed longer for more exploring and hiking." The group was wonderful (everyone was timely and pleasant and fun) and Patrick, our guide, was very knowledgeable, personable, and accommodating to everyone's needs and wants. He chose excellent food and restaurants and always was willing to add pleasant extras such as hikes and walks to explore the areas during our "down" times. When we got to Chamonix, the big lift wasn't working, but Patrick had an alternate plan for us. The last supper was memorable! "Day 12 in the Vineyards of the Cotes du Rhone was my favorite day. Loved the walk to Mourchon Vineyard & Winery. I learned a lot about growing grapes, loved the lunch in the courtyard, and the tastings. The best part was the hike back to the hotel. Beautiful countryside! Chamonix and the Alps was truly a wow time!" Patrick, our fearless leader, and our group of happy travelers made our exploration of Eastern France memorable. We arrived two days before the start of the tour to acclimate. It took two buses, two planes, three trains, and our feet to get us to Reims. We stayed in wonderful hotels. The Grand Hotel des Alpes was luxurious and the views from Hotel Beffroi exquisite, both were romantic. Thank you for making our travel adventures so wonderful. "Tram up to the glacier of Mont Blanc, hiking across the peaks to the cog rail back into Chamonix. Spectacular!" A wonderful overall experience! Each day was filled with fun and informative activities reflecting the uniqueness of the regions we visited ie the food, the wine, the history and the everyday culture. A very special guide, Patrick, a most friendly and fun loving group of travelers, and the beauty of Eastern France combined to make this one of my top two favorite tours and I have been on 9...this was my second time taking this very tour. "Each day had at least one! My favorite was looking out the Hotel Beffroi window at the bell tower and the vistas of the lower town of Vaison de la Romaine at sunrise and sunset"
very nicely paced tour with a good mixture of wine tasting and sightseeing. "nothing stands out - the entire tour was great." This was our fourth Rick Steves tour and once again it didn't disappoint! We love the format of these trips, particularly the ones that go to small towns. The group of 24 folks all got along beautifully (like minded, loved to travel, curious, adventurous types). Our tour guide, Patrick, was so knowledgeable, helpful with directions/ideas and just an overall nice guy! Would highly recommend this trip of Eastern France, great variety! "My "wow" moment was the French Alps. We stayed in Chamonix for 2 nights and we had the absolutely most beautiful, clear, blue sky days! Going up to the top of the mountains was just spectacular! We also like the Mouchon Winery tour/lunch. Kate was so knowledgeable about the growing of grapes, making of wine, and everything else involved in the business that it was a pleasure listening to her and having a better understanding of the wine business. And their wine was great too!" This was our 8th tour and one of our favorites! My husband and I loved visiting Eastern France and the itinerary was perfect. We liked the hotels very much and done far exceeded our expectations! Patrick, our guide, was really wonderful! He was enthusiastic and very knowledgeable! Our group loved him. "I think our favorite "wow" moment was seeing the mountains In Chamonix! The days were sunny and warm and perfect for our visit. The hotel was wonderful! We loved the cable car ride up the mountains! Colmar was also a favorite for us!" Tour guide Patrick was a delight. Enlightened the group with both historical and geographic information. Not to mention his animated personality. France has been a dream come true for this retired traveler. "The entire trip was a big wow! Alsace and Provence in particular. Verdun was a visit to where my maternal grandfather fought during the Great War." This was our 3rd RS tour and, as always, was well organized and thoughtfully planned for maximum enjoyment! Hotels, meals... everything! kept us truly immersed in the culture and sense of place of each beautiful town or village! Experiencing all of the varied wines and viticulture characteristic of each growing region were, of course, a big part of this tour and the wineries, tastings, and knowledge imparted did not disappoint! "While every new village seemed more picturesque than the one before, our biggest "wow" was Chamonix and Mt. Blanc in the French Alps! Having never seen the Alps "up close and personal", I was completely blown away by their breathtaking beauty! I couldn't stop looking up at them in awe for two whole days!" A wonderful tour! Great wine, great group, great tour guide(Patrick)! And Henri, our bus driver. I loved the towns we visited. Each had such charm and comfortable lodging and great food. Every day brought new experiences and learning. These are the experiences you would never have if planned on your own. There was adequate down time as well. This was our third trip, and I find them all to be consistently wonderful. Rick Steves' concept of traveling works so well! "the beauty of Mount Blanc and Chamonix and the wonderful experience at the last winery with a wonderful lunch being served in the courtyard!" The charming and scenic towns, such as Colmar, Annecy, Beaune, Vaison la Romaine and especially Eguisheim, were wonderful. The winery tours and white wines were great, the reds not so much despite their higher prices. even though they usually were priced higher. The guide, Patrick, and the meals were the best of the four Rick Steves tours we have taken. Skip the so so boat tour in Annecy and the walking tour in Aix and spend the time at the markets before they close. "The medieval village in Vaison where we stayed in a charming old hotel for three nights. Also the Theater of Orange, which is easily as impressive as the Coliseum in Rome. The Mourchon winery tour and lunch were wonderful during our stay in Vaison. Chamonix was also very scenic and we had perfect hiking weather." It exceeded my expectations and every thing was so well organized and planned out. I was able to get a real feel for that part of France and every one we met was so kind and receptive to our tour group. Patrick was funny, candid and very well organized through out the trip. Give him a raise! Well done Patrick and also Henri our bus driver!! "Chamonix knocked my socks off with the beauty of the mountains. I am an "Alps Person" and that Mont Blanc area was breath taking!" Great tour. The pace was right--very relaxing. Patrick, Henry and my fellow travelers made this an exceptional experience. "Lunch and winery tour at Mourchon winery. Chamonix and mt blanc." Very good: excellent tour leader; good choice of activities; good on site tour guides; and nice selection of hotels. The tour was a great introduction to Eastern France...although we had visited some of the sites before. We loved it. "Colmar. A great city to walk around, d it had some good restaurants. Les Chenins de Lumieres in Beaune. Chateau de Rully (near Beaune) with the Count showing us around. Our hotel in Vaison-sur-Romaine...Hostellerie le Beffori. It was a walk to get up to it but the rooms were large and having meals outside in their courtyard was a very special experience. The wine tastings, especially Domaine Mourchon and the delightful lunch in their courtyard. Probably the most informative of all the tastings"
Excellent in every way! This is what we have come to expect with a Rick Steves Tour....consistent high quality traveling. All we do in join in with a lot of enthusiasm and enjoy the experience ... wondering ... where shall we go next! "One of the reasons I chose this trip was to feast my eyes on the "WOW" grandeur of the beauty of God's creation, both the green hillsides of the vineyards lands and the fabulously impressive French Alps .. which we came back after the tour to enjoy 8 superlative hiking days in the face of the Mt. Blanc range." Excellent overall experience. Toni did a great job communicating and organizing, great sense of humor. "The visit to the winery near Vaison La Romaine was excellent. Learning more about the origins of the Statue of Liberty at Colmar. Seeing the battlefield and fort at Verdun." This tour was great from start to finish. Our tour group was wonderful, the itinerary was balanced and interesting, our guide Patrick was amazing, and the countryside scenery with the vineyards was beautiful. The wine tastings in the different regions was a highlight especially the family vineyards. The weather was wonderful throughout particularly in Chamonix where the Alps were spectacular. Henri our bus driver was very interesting and did a great job navigating us through some tight spots. "There were two "wow" moments for me. One was the view of Mt Blanc on a beautiful sunny day from Le Brevent. The other was the wonderful picnic provided by our guide Patrick at Chateau De Rully overlooking the beautiful vineyards." A great blend of history and French culture. While this itinerary doesn't quite pack the wow's and must-see sites of some tours, it's nice to have a somewhat more low-key itinerary geared toward soaking up French culture and appreciating the personalities of the various regions. Vaison was a surprise treat I never would have found. Our group was great and Patrick was an excellent and very thoughtful guide. As others have mentioned, some of the long, late, heavy dinners need to be re-thought. "Wows: Gawking at the views of Aiguille du Midi and Mont Blanc with tour mates above Chamonix as paragliders drifted by on a near-cloudless day; standing at the edge of a classic Provence lavender field in full bloom; the streets of Colmar during La Fete de la Musique on the longest day of the year; the lovely outdoor lunch at the Mourchon winery; the chirps and croaks of the night critters in Vaison; being among cheering throngs in Aix as France won a World Cup game." "I dont really have a favorite 'wow' moment [it isn't my style], I just try to absorb as much as possible"
"Taking the gondola up to the top of the Mt. Blanc ski run area and seeing the parasailers floating in the sky with the snowy Alps in the background. Touring the vineyards and winery in Seguret. Loved Provence and the rich vineyards area. Great tour, lunch afterwards and high quality wins." Another wonderful RS tour! I enjoyed visiting the small towns in Eastern France, and learning about French culture and history, and the wine industry. Our guide, Patrick, was enthusiastic, very knowledgeable, and took good care of us. "The stunning view of Mt. Blanc and surrounding mountains from the top of the cable car in Chamonix on a clear day!" We had a wonderful time on the Eastern France tour. The pace was busy and the weather went from rain showers to very hot! The tour group was fantastic, and the sights were wonderful. Lots of great wine tasting and good food! A little bit more free time would have been welcomed, but we managed to do a bit on our own. We made some great friends as a bonus! "For me some "wow" moments were sitting in Vaison-la-Romaine in the evening eating outside and listening to great music on summer solstice evening. Watching the city celebration of families, children, dogs out for the festivities was amazing. Also, Chamonix and the ice cave were a highlight too." We expected our tour to be about wine and were not disappointed. I enjoyed visiting wineries, especially meeting a real DUKE in his chateau! However, I skipped the walks through the vineyards because one vineyard looks exactly like another, and because I wasn't physically able to walk on the paths. My complaint about this tour was that Toni walked far too fast for many of us to keep up, and she didn't wait for us. Dragging suitcases for many blocks over cobblestones was very difficult. "Finding the old cathedral in Orange was exciting. Toni didn't even include it in her information about Orange, but only focused on the old Roman theater (only the back wall of which was original). Since we've seen lots of Roman ruins already, this one was a bore. We found the cathedral by chance and were fascinated to see the restoration as well as the very old paintings underneath newer layers. This church has a deep historical interest which should be part of the tour and not ignored." This was our 7th Rick Steves tour and as with all our prior experiences, the tour was wonderful. From the itinerary, to the accommodations, to the activities, and, most of all, our wonderful tour guide, Toni, the entire trip was pleasure. Great job! "In a trip full of "wow" moments, it is very hard to pick just one. If pressed, I would have to say it was the day spent on our own in Chamonix. Sitting on a terrace facing Mont Blanc as para-gliders swirled around overhead was so memorable for us." This is our third Rick Steves tour. The overall tour met/exceeded expectations. We had not previously been to any of the areas visited.It gave us the opportunity to see France "outside of Paris"
"No one "wow" moment. Memorable items include: Reims Cathedral, Pommery champagne cave, Verdun fort/battlefield memorial, Colmar - picturesque buildings, Eiguisheim, Hotel Dieu in Beaune, Kroenigsburg castle, Chateau Rully & picnic, Chamonix town & ice cave, Annecy lake boat ride, Vaison la Romaine Puymin ruins, and all of the wine regions & chateaus"
This was our 3rd RS tour and we enjoyed it as much as the first two. I enjoyed the diversity of the destinations, the wine tastings, the charm of Colmar, Eguisheim, and Annecy, and the views of the French Alps in Chamonix. This was our second tour with tour guide Chris and we had a great experience with her again as our guide. A good group of tour mates and a good bus driver made for an wonderful experience. There was a good balance of bus time, guided activities and free time. "My WOW moments included the charm of Colmar and Eguisheim in the Alsace region, taking the lifts to the top of Mont Blanc for spectacular views, the wine tasting and picnic on a perfect day at the Chateau near Beaune, and the boat ride on the lake in Annecy." I loved this tour! Everywhere we went was beautiful. Chris was an amazing guide and our bus driver, Jos, was great! The bus was very comfortable. "There were so many! We kept saying "pinch me"!" Really good tour with really nice fellow travelers. Probably the best group we have traveled with. Guide Chris was very good, really knowledgeable about the different places we visited. She is as good as it gets for a guide on a tour. Our driver, Jos, did a wonderful job of driving the bus, and he was really personable. He became "one of the group." I didn't like the smaller bus as well as the bigger buses we have traveled on on the past. Just my preference. "Well, more than one WOW moment for me. Visiting Colmar, Eguisheim, Annecy and riding the Midi lift in Chamonix. Thank God we got there in time to ride it before it closed for a month for repairs." Great tour itinerary and tour guide. Chris was fantastic. "Mouchon winery tour and picnic was awesome." It was wonderful! What more could one ask than a great guide and driver, a wonderful group of travelers, fabulous scenery and architecture and art, and super delicious wine and food? C'etait merveilleux! "I was not expecting to feel so moved at Verdun. The museum was so well done, so touching and heart-rending. I wish everyone who has any responsibility for sending people to war would go there." This tour exceeded any expectation I had. It was my first guided tour, so I didn't know what to expect. What I got was a tour of the parts of France I would never have gone to on my own, and I also had my eyes opened to 'back door' travel. I loved every minute of it, including the parts I was hesitant of, like tours of historical sites. Julie, our guide, was top-notch. Julie knows France, and having her guide us enriched our experience. What a fantastic trip! "Well, the whole tour was great, every city we visited was fabulous. But I have to say my favourite experiences were making new friends with a new couple from Texas and having long dinners with them. But also, in Vaison de Romain, we spent this magical evening in the courtyard of the hotel, with our new friends from Texas, and new friends from Berkeley, eating a simple supper of baguette, cheese, strawberries, and several bottles of local wine, purchased from the local shops. It was perfect." "Cannot decide. I loved the Pommery champagne winery tour, the family owned winery near Equishem, Verdun WW1 tour, walking tour of Reims, cellar dinner in Beaune"
This was a most informative tour all along the way. I enjoyed exploring the old cities and important sites of WWI (Verdun) and WWII (Reims). I particularly enjoyed Colmar. I greatly enjoyed the wines and cuisine of each region and getting to know some of the locals up close. Having experienced Beaune and Ruilly on a RS tour in 2004, it was fun to revisit the area. "Hard to say because I enjoyed so much of the entire tour. However, Chamonix was very impressive and lots of fun. Also very somber evidence of effect of global climate change on the glaciers. That was a "wow" of the wrong kind! I was very surprised to see and very interested in the old Roman ruins at Vaison-la-Romaine and Orange. Very impressive evidence of the advanced culture they created. And, finally, YES, I very much enjoyed visiting the Mourchon winery!" The Eastern France tour with Julie was a wonderful experience. We experienced the different personalities of each town that we visited with fantastic guides arranged for us by Rick Steves. The mix of free time and educational opportunities was just right. Julie provided in depth information about France, the government, society, education, health care, customs, food, wine, and so much more. Definitely as recommended trip. "The mountains and glaciers of Chamonix were massive and incredible. There were many enjoyable moments that it is hard to pick just one. We enjoyed our winery tours, tastings, and the fabulous meal provided at the winery in the Cote de Rhône region." Don't have enough space to say all the great things. Julie our guide was fantastic and Hilde our bus driver was great too. The tour dinners were great-often local specialties I never would have known to order if I were on my own, and thoroughly enjoyed it all. Loved Colmar, Beaune & Annecy. Chamonix was stunning. Enjoyed our tour of Chateau de Rully. Loved the food, wine, desserts & treats everywhere. Had a good group-made some new Canadian friends. Having so much fun reviewing all our photos. "Favorite wow moments were the markets at Colmar & Annecy but specially enjoyed the market at Beaune, shopping for our group picnic on the grounds at the Chateau de Rully. Great artsy photos of the local vegetables & meats & cheeses at the markets - definitely NOT something you see back home. The Mourchon winery was another wow moment - enjoyed it & the group lunch at the winery. Colmar and Chamonix were definitely wow towns." Excellent tour - loved the wine tastings, gorgeous countryside, pace of the tour and beautiful old towns and architecture. The Stintzi winery tour and wine tasting was excellent. The couple who own the winery are delightful, personable and the wine was delicious! The staff and family at the Mourchon winery were very hospitable providing us with a very delicious home made meal and wonderful tasting of their wines. The boat ride on Annecy was picture perfect! "Waking up to an incredible thunderstorm in Vaison la Romaine while in the Hotel Belfroi. The rain poured, thunder crashed and the lightening lit up the sky as I looked out on the city below from high atop this amazingly old and beautiful hotel. Magical." This was, for me, a trip of mixed feelings. At the end of the trip I was feeling that it was not one of our best (of 8) that we have taken. Too much like things including lots of grape vines. But I take lots of picutures and build a book with each trip and going over the pictures shows that we did- indeed- have some very interesting adventures. The small villages were the best with Colmar the most charming. "Boat ride and walk in Annecy on market day." "I'm not much of a wine drinker, so it surprises me that my favorite WOW moment was the winery and fantastic lunch in Vaison-la-Romaine, hosted by the Scottish owner and his family. It was just a magical day and setting. The visit to the olive maker (and clay modeler) just before lunch was a treat." It was a great tour starting with our tour guide Chris, the venue and the other travelers. Chris was a wealth of information from knowledge of the country, people and the language. The choice of towns, sites and wineries were well balanced. The other guest on the trip were warm and friendly. We now have some new "best" friends from Dallas. "The winery,Mourchon Caveau, in Cotes du Rhone was fabulous! We toured the vineyards, tasted the wines and was served a beautiful lunch. Coffee was served in the families china. We also had the opportunity to purchase and ship wine home." "It might not be a "wow" moment, but the most pleasurable experience was the wine tasting and lunch at the Mourchon winery in Seguret. There were many "wow" moments as I walked in Chamonix and looked up at the snow-covered mountains." "Chamonix provided my wow moment. Although the weather was cloudy, the opportunity to ascend partway up some of the slopes were thrilling and had great views." The tour was very interesting with new sights and experiences. It's great to be in a centrally located hotel so that we can go out on our own and explore the town we're in. There was a good balance of sightseeing with a guide and time to explore on our own. "Chamonix was my "wow" moment. Even though it was quite cloudy the day we visited we still got glimpses of the surrounding mountains and a sense of their grandeur. The ride up the gondola was worth it as we were in and out of cloud and got to experience the cold at the top. The train ride to the glacier and the walk down to the glacier and into the ice cave was a very unique experience." This is my 4th tour with Rick Steves. The lodging and food was the best on this tour. The hotels and inns were welcoming, many rooms were generous in size, the plumbing was more than adequate, and the wifi worked quite well. A couple of times the food portions were a bit large. However the meals overall were excellent. I really enjoyed the art and history. "Not so much of a "wow" moment as a "wow" village. Eguisheim in Alsace was very charming. I would like to have more time to explore this enchanting town." My overall experience of the tour was excellent. "The day in the French Alps and the excellent wine tours." We have used your guide books for years to travel on our own, never taking any tours, until Sicily last November with Nina. This trip with Daniela was equally wonderful. We asked some of our group who have made several trips, "Have you ever had a guide who wasn't great?" Answer, "Never." I enjoyed everything about this trip, and Sicily, thanks to Daniela and Nina. "Really hard to say. Several such moments: the rolling view of eastern France from the bus, the cog rail trip and gondola and stairs to the glacier, fondue dinner, and getting to meet our travel companions." We had another wonderful trip with Rick Steves! This trip was rich in history and beauty. We learned a lot and saw some amazing sites, and some that really made us remember all those that died in both WWI and WWII. The weather could have cooperated a bit more in some of the cities, but we did not let it stop us. Everything was really great, the accommodations, the food, the bus, the company, and especially Daniella and Hilda. Everything and more that we hoped for. Thank you! "There were many. The most somber "wow" moment was the trip to Verdun. Riding the gondola to the top of Mt. Blanc was spectacular as was Mer de Glace, the glacier. The trip to the Mouchon winery and lunch were one of our highlights of the trip. Seeing the storks nesting in Alsace was also a wow moment." I had a fantastic time on this tour. It was so enjoyable and informative - the trip of a lifetime! "I was especially moved by the Battlefields of Verdun experience." I really loved the variety of activities, the knowledge and friendliness of our tour guide, and the pleasant way everyone got along. Our bus driver was excellent, and there was enough room that no one felt they had to jostle for seats. I was delighted to see things I never would have thought to have planned to see if I were planning my own vacation. Being a guest of local people, hearing directly from them, tasting their wines--priceless to me. "Visiting the chateau and picnicking on the grounds is a memory I'll cherish. Being escorted through the chateau by the count, listening to his family stories and enjoying his wine! You just can't beat that for a fabulous memory." Overall the tour was very good. Good balance between tour, free time and bus time. "Probably the winery lunch and the Altarpiece in Beaune. Also, I have a new appreciation for storks." This was our 10th Rick Steves tour, we keep coming back because his formula works for us, we just "show up and have fun." Verdun and Cote du Rhone were a big draw for us and we were not disappointed. We like to think of these tours as scouting trips where we get a flavor of the local area and are exposed to the most important sights we might otherwise miss on our own. We have gone back to several RS tour areas that we enjoyed and wanted to spend more time there. "Domaine de Mourchon was my favorite experience of the tour. The story behind this self-made man and his family, their fabulous wines, and a great lunch with perfect weather and the chance to socialize with fellow travelers." Wonderful tour! So interesting to see these beautiful, distinctive regions of France. Great guides, wonderful travel companions, exceptionally beautiful days. "Reflecting on this trip, I keep thinking of all the great views...the vineyards, towns, mountains. It was one beautiful day after another. Just great." I was extremely satisfied with the tour. The balance of organized time in free time was just right. The hotels were pleasant and well located. The group meals were well chosen. The size of the group was fine, although lacking in diversity. The schedule was comfortable. The bus was also comfortable but lacked Wi-Fi and recharging outlets. "Because my birthday would occur during the tour, I was one of two guests permitted to learn the art of sabrage – topping a champagne bottle with a saber. This was a great moment." This was our 5th RS tour, and they do nothing but get better and better. The planning of this tour was just outstanding. An extra day on the Verdun battlefield would have been beneficial to its appreciation. The local guides were outstanding as usual with great insight to their areas. The blend of German and French influence in Colmar was irresistible. Vaison la Romaine was so full of history and charm we did not want to leave. "I had three of these. First was the Ossuary at Verdun. The place was haunting. The second was high about Chamonix on an absolutely clear day seeing Mt. Blanc in one direction and the Matterhorn in the other. The third was the serenity of lunch at Walter's home in the Mourchon winery. Heavenly!!" Of our 5 Rick Steves' trips to date, this one was probably our favorite. We had perfect fall weather for almost all of the trip, our guide was excellent (and it was nice to have a very good tour assistant along as well), our group of travelers was fun and got along well, the cities and hotels that we stayed in just seemed to get more charming as we went along, food and wine was excellent -- it was a wonderful trip! "There seemed to be numerous "wow" moments on this trip. Two of them involved food and wine. The first was a visit to a chateau outside of Beaune where the count gave us a tour and had a wine sampling for us followed by a perfect picnic on the grounds. A similar visit to a Cotes de Rhone winery with lunch at the owner's home was exceptional. And finally 2 days of perfect weather at Chamonix and in the French Alps was simply magical." We were looking forward to experiencing the wines, foods and terroir of Eastern France and this tour surpassed all our expectations. Virginie guided us through history (Reims' 1211 cathedral to the largely unknown end of WWII), wines (Champagne to Alsace to Burgundy to Provence), foods (local, fresh and delicious fare) and sites (vineyards, olive groves, Mont Ventoux and the French Alps). Amazing! "Aside from the 9th century talisman of Charlemagne; 13th century Reim's Notre Dame cathedral; sober Verdun; markets with amazingly fresh and tasty foods; Koenigsbourg castle views; Chateau de Rully visit & picnic; Mont Blanc & Alps of Chamonix, Mourchon vineyards, winery and picnic with the owners; and Mont Ventoux of Tour de France fame, I can't think of any "wow" moments." This was a wonderful trip. The guide was excellent, the itinerary was just what we wanted, and the weather was excellent for the beginning of October. "Lunch on the lawn at Mourchon vineyards near the village of Séguret was worth the trip by itself. The food and wine served was probably the best we had in France but more importantly the setting was incredible. We were next to the beautiful vineyards with views in all directions of the lovely countryside and hills. Add the good company and it was perfect." I really enjoyed the itinerary and the different guides we had. This tour had a wonderful mix of history and culture and, our reason for taking this tour, vines and wines. Virginie did a fabulous job of preparing us for each stop, encouraging us to try local food and wine. She also spent quite a bit of bus time helping us to understand American/French cultural similarities and differences. "Verdun. We had seen the American WW2 cemetery in central Italy last year, but the Verdun experience was amazing. Thanks, especially to our local guide and to the excellent explanatory film." This tour was more than a tour--it was a discovery of different regions of France, aided and assisted by the best of the guides I have had on a Rick Steve's tour...and we have had many. The guide, a former teacher who had visited the US for a number of years, created a fictional couple whose interactions with other French persons and the government, employer, etc. provided the framework for a delightful narration that covered the life of an average French person. "Something minor, but something unique: a picnic at a castle, with a wide variety of food harvested from the Market, along with fine wine." This area of France has so much history - good wine and customs to see that it was a great trip and a very fast two weeks. Virginie and Michaelanne did a great job of keeping us in good health ( some of us came down with a bug) and they made sure we where taken care of with seeing and talking to the right people. The hotels where the Rick Steves' normal - great location and able to walk everywhere. The transportation was excellent from town to town and around the tour areas. "The Roman Ruins - For things to last 2000 years is just amazing to me, since we are used to tearing things down after 50 to 100 years. The wine that was on tour was great and the tour of the vineyards and olive groves was fantastic." This was an incredibly fantastic experience. We enjoyed many varied experiences in just 2 weeks! Our tour guide, Virginie was truly an excellent educator. We traveled with a wonderful like-minded group of people. France is quietly beautiful, except the Alps - breathtaking. Fascinating, the variation of countryside we saw in such a short period of time, from quaint, flowered villages, modern city, to vineyards and snow covered mountains. "Not a "wow" moment, but a place, the Maurchon Winery. The winetasting was informative, the vineyard walk educational (loved being able to sample the delicious left over grapes). And the lunch. What a setting, perfect weather, wonderful food." The overall experience was wonderful. We got lots of information in an easy to understand and remember form. The tour was fantastic. I have been to France a few other times but not to Eastern region. It was very diverse and offered beautiful scenery, good food and it was a terrific group of folk as well. Chris was a wonderful guide and I found the travel to be very easy. "My favorite "wow" moment was in Chamonix, taking the gondola up to 12,600 feet and viewing the spectacular Mont Blanc and other mountains. It truly took my breath away." Great itinerary. Perfect for our first tour. Could have done without the stop at Verdun. Too long and too depressing. "Going up to Mont Blanc in Chamonix"
We totally enjoyed our Easter France tour and felt that Chris had a major part to play in our response... She is amazing young woman who is inclusive, sensitive to others, VERY knowledgeable and always positive, What more could you want! We were the only Canadians along with our neighbours from the US and felt it was a great time to get to Know our friends in the south! "The time spent in Chamonix..the cable car ride to the top of Mt Blanc Although we live near the Canadian Rocky Mountains we were still most impressed with this and the views to be sure Loved our hotel there as we had a balcony to share with several of our tour mates and were able to have a small get together on the deck while gazing at the mountains ( at happy hour and good French vino!) So was quite a Bonding time for us all!" Very enjoyable and well organized, as with last year's Loire to south of France. "Actually my "Wow" moment came when another tour participant and I played hookey from the Colmar scheduled tour afternoon and took off for Mulhouse to visit "Cite de Automobile." "Cite" houses an incredible collection of cars, including two of the seven existing Bugatti Royales. Probably not something to include on the "regular" RS tour itinerary, but for sure a fantastic side trip for anyone with an automotive bent." Chris was an outstanding tour leader and knew her history of the areas we visited. She was also sensitive to a problem I had and gave me some yoga exercises to try out. We had an exceptional tour group and we all seemed to get along. I would travel with this group anytime. "The French Alps in Chamonix....wow! So beautiful!!!" Well planned/paced itinerary introduced us to beautiful and distinctly diverse regions. Leader Chris was exemplary- intelligent, informative,intuitive. She took time to know tour members and reached out to enrich individual experiences. Hilde was the best driver we've had- skilled, personable, helpful. Groups meals were lively,memorable events even if the food wasn't. Hotels were all clean and well located, some were more comfortable and safer than others. Group was friendly and supportive. "Happy hours organized by Chris were real "wow" moments. They created camaraderie and enhanced the overall experience as members shared their ideas/experiences with each other. Each region had uniquely spectacular vistas, but the lunch at Mourchon was idyllic. It created a lifetime memory for sure! Group had many (very nice) family/friend "cliques" who did things together, so we were "wowed" when we also "clicked" with a couple of tour members. We had such fun together!" I have taken three Rick Steves tours and this one was my favorite. Julie and Emily were a big part of the reason I enjoyed the trip. The tour was a very nice mix of walking, bus time and personal time. Time spent in each town was well thought out and utilized. "Meeting Emma Stone for a drink and having a nice visit next to the swimming pool of the Belfrie Hotel. That kind of experience seldom happens twice but once was fine." The E. France tour was our 3rd Rick Steves trip and the best we've experienced thanks to the itinerary (slower paced, smaller towns/villages, picnicing in the vineyards, visiting with a Count in his chateau, etc) and thanks to our outstanding tour guide, Julie. She transformed all of our experiences into stories, was caring, very knowledgeable and fun. Emily, our tour assistant, was an added bonus. We would definitely rate this as 'highly recommended' out of the tours we experienced. "My favorite 'WOW' moment was riding in the back of a red pick-up truck with my tour-mates, up a dirt road, to a vineyard in the region of Provence. The tour of their winery, their dogs and an outdoor authentic French picnic was the highlight of my trip. I shall always remember it." Though not quite as exciting as the Paris & HOF tour, overall a good tour. Our very nice guide, Julie, was well experienced and was able to give us good insights and suggestions. Slow start in Reims without the lightshow or wine cave tour at Martel, but the tour improved with each location! Good overview of many picture-perfect regions of France and good experiences. The extra lunches and included wine were nice treats! Great balance of group time and free time, as expected. Loved our group! "The free time in Chamonix to explore and do many things -- gondalas, glaciers, bike paths; the optional get-togethers, picnics and other extra lunches together, the count's wine, too-cute Colmar and its indoor market, beautiful Lake Annecy, dinner with other tour friends at The Chez Toi in Vaison, outdoor markets..."
Everything was perfect: tour guides/group; places visited; communications, before and during; comfort, food, wine, accommodations, transportation; value and more. We are looking forward to our next Rick Steves tour. "This tour - Best of Eastern France - is one "wow" moment after another. It is impossible to pick one. Every experience - Gothic cathedrals, famous works of art, Roman ruins, UNESCO World Heritage sites, standing on top of Mont Blanc, hiking vineyards, drinking French wine where it is grown, strolling outdoor markets, meeting French people - is memorable and unique." This was a very good tour. I really enjoyed all the smaller towns on this tour, especially Colmar. The wineries were interesting and the wine tasting was fun. The weather in mid September was perfect. Chamonix was magical. "My Wow moment would have to be the incredible beauty of Mount Blanc. Whether it's the view from town or from the lookout at Aiguille du Midi, it is breathtaking and I couldnt help but marvel at the work of the "Creator"." "Vaison town, and Walters Winery!" It was a wonderful trip. Our group included our daughters (28 and 30) so that was a consideration to take into account. The presence of Virginie and Karin was key to their positive experience as the typical age was mid-60s and older. Another helpful aspect was the amount of unstructured time. As time passes since the end of the trip I find that the knowledge I gained about France through what Virginie shared during the bus rides is one of the take-aways that I did not expect and that I value. "Visiting Domaine de Mourchon - wonderful, informative, dynamic tour of the vineyards and the wine making process. The tasting was great as well - loved how they said there would be a question at the end and a prize - we were an attentive group. But the 'wow' was the gracious luncheon served at their home in their beautiful yard surrounded by the vineyard on a sparkling sunny day (had not had a quantity of sun until then). It was a dreamlike experience. The family was so warm and welcoming." This was my first RS tour and it was a wonderful experience! Virginie was an excellent guide, introducing us to the history, food and wine of France. She made us realize the diversity and uniqueness of each of the regions we visited. Even the hotels we stayed in were unique. My favourites were the Ramparts in Beaune and Hostellerie le Beffroi in Vaison la Romaine. "My Wow! moment was the day we visited the Mourchon winery in Seguret. it was a wonderful sunny day in Provence; hiking up the road to the winery, visiting the vineyards and cave and, most of all, the wonderful lunch we shared at the owners' home overlooking the vineyards where the crop was being harvested. it was a unique experience which, travelling on my own, I would not have experienced. My fellow travelers who had been strangers 2 weeks previously were now a group of friends. A perfect day"
We had a fantastic Tour Guide, a wonderful group of tour members and a fabulous itinerary. "Verdun. We were at Verdun on a gloomy, rainy day. It was very moving." "Toss Up..... Chamonix with the experience of the Aguille du Midi with an exceptional day viewing the top and Mont Blanc?? Mourchon Vineyard meeting Walter and his family with a great tasting and lunch with the best sunny day possible and a hike down through the vineyards back to Vaison la Romaine ?? Or the fantastic French countryside and lovely people everywhere.... take your pick..... lovecorkandbetty"
I had low expectations for eastern France. I had previously been to Paris a couple of times and it's a very fun place to visit for all the well-known reasons. I had also previously seen the countryside from the London-Paris bullet train and visited Reims for a day. I just assumed, ridiculously, that the rest of France would look like the little I'd seen. I was so so wrong. The countryside of eastern France is beautiful, the people friendly, the food fantastic, and the history interesting. "The lunch at the winery in Provence. Great winery tour and the food tied for the best lunch I've ever had in my life. (Tied with a lunch outside of Parma, Italy 30 years ago.). After lunch a few of us walked back to Vaison La Romaine along a road empty of traffic through a quiet, mostly shady, oak forest...beautiful." "Going across to Italy on the cable car at Chamonix, also the lunch at the Murchon's vintner outside of Vaison la Romaine." We had, as usual, a very good Rick Steves tour experience. Just enough "tour" time as well as "time on our own" along with a good group size and a great tour leader. "Chamonix. French Alps are magnificent. Wish we had a 3-night stay in Chamonix as well." This was my 12th trip with you folks and it was as good as the others. "This was not part of the tour but I got to visit my grandfather's house outside of Colmar. He came to the US 130 years ago and the house was in the family until 2010. The big reason I went on this trip was to go to Colmar." Overall the tour was just good. Our guide was excellent and the tour itinerary was good as well. My complaints are with the food and the hotels. While we had two good meals on this tour (beef Bourgingone in Beaune and fondue in Chamonix)the rest were not good. Overall on a scale of 0 to 10 I would give the food on this tour a 3. I would recommend finding different restaurants to bring the tour groups to. The hotels were a mixed bag. Some were OK, others were barely adequate. "Taking the cable car from Chamonix and over to Hellbronner Point. I would have appreciated another day in Chamonix in exchange for one less day in Provence." I learned a ton and loved seeing so many beuatiful parts of France. "Chamonix is amazing! Beautiful mountains, charming town, and yummy fondue. I also really enjoyed renting bikes from our hotel in Beaune and riding through wine country. That bike trip is the best ride I've ever taken!" Beaune-Hotel Des Ramparts, 8/25-8/27, unsafe hotel. We were placed on the third floor. Uneven floor tile, loose tile, no lightning in stairway going from second floor to third floor, dresser drawer turned upside down on top of small refrigerator to hold up a counter shelf. Informed tour guide Julie about our room and she noted they never have Rick Steve's guests placed on the third floor! Only way to receive Wi-Fi was to leave room and go into courtyard. I will send pictures of our room. "There were several. Hospital in Beaune and the evening light shows on several buildings in that beautiful town." A very thorough itinerary, combining wine, history and food with a consummately professional guide and a compatible group of people. "Living in the shadow of Mt. Rainier, I was mildly skeptical of previous posts lauding the Aguille Midi and the view of Mt. Blanc. Their reviews encouraged me to make the trip and it lived up to their enthusiasm. My other "wow" was marveling at the RS Tours ability to continually find exceptional guides. Each has their own style, but they all excel at what they do. Julie brought our group together as a cohesive traveling unit, which added to our overall tour experience." "It's hard to pick one moment, but here are two The awesomeness of the area around Verdun---what those people endured Chamonix and the amazing Mount Blanc ...."
This is our 4th RS tour, and it did not disappoint. Except for the weather, which was incredibly HOT, we enjoyed it all. The group was congenial, our guide Julie was outstanding, the bus was comfortable, and the sights.....well, those were just incredible. The included meals were incredible and delicious, the extras were wonderful surprises. And Julie smoothed the way for anything that was slightly stressful for us. "I think I probably said "WOW" about 100 times on this trip, so I can't state my favorite one. Each area where we traveled was different from the last, and each had its share of beauty and enchantment. My favorite town was Colmar, my favorite medieval site was in Vaisson, even if we had to climb that horrible hill to get there. Wow is an understatement for much of this trip." I really enjoyed the tour. The itinerary looked intriguing on paper and was even better to experience. Julie was an excellent guide and we had a very friendly, flexible travel group. There was a good mix of guided time and free time. "My "wow" moment came at the end of the tour as I realized how really varied the country of France is--a real mix of "mini-countries" combined with defined sense of what it is to be French." We had wonderful tour. Great itinerary, spectacular sights, and a terrific guide. "I have difficulty defining wow moments, it was a great experience." Loved it. Julie was magnificent as a guide. "Going to Chamonix to the top of aquelle du midi and going to Kayserburg to retrace my father's steps during WWII in the Colmar area." I like places that are "off the beaten path." It was fun staying so close to all of the activities and local people. I also liked having the option to explore on our own. It was a perfect balance. "Hiking in Chamonix! We took a hike recommended in the Rick Steves Book. It was challenging but I was awestruck by the French Alps. I also really liked the tours with Jean Claude (Alsace wines) and the Mourchon Winery." Better than what we expected. Excellent tour guide, driver, & all amenities that came along with it. "Too many to list but the most memorable one is the three nights at Vaison la Romaine." Loved the tour! The people were fabulous and fun to get to know. Reims' cathedral was beautiful and the history behind it extremely interesting. What a great way to begin the tour by viewing the cathedral light show. I loved Colmar along with the Alsace culture and food. Chamonix was my favorite place we stayed because the alps were on my bucket list. Now I've seen the Alps from the Switzerland, French and Italy side - all with Rick Steve's tours. Fabulous! Loved the hotel at Vaison. "My wow moment was the French Alps in Chamonix!!! The alps were gorgeous and I loved the gondola ride from the top of the tram over to the Italy border. Viewing the glacier from above was breathtaking!" The Eastern France tour was outstanding. Our guide Daniela was excellent; she was very informative about life in France and Germany and ensured we were all ready for each stop. She was clear and to the point in pointing out the highlights of each city. The bus was very nice; our driver was great. I like to have the room afforded with pretty much each person getting two seats. The smaller group size also helped at most sites; something I love with RS. "The wine tour and lunch in Seguret at the Mourchon winery. Very much a home feel and great food." "Too many to pick just one: an impromptus organ concert in a 13th century church in Reims Wine tasting and picnic in a 14th century chateau Visit to a 20th century church proposed by our wonderful guide, Daniela"
Every day was filled with a new and unique experience. From wine tasting (very frequently) to explanations of the wine making process during a picnic in a vineyard setting or a castle actively producing exceptional wine to visiting Roman archeological sites. The small group of 19 travelers allowed for personal interaction which was stimulated by the outstanding personality and knowledge of our tour guide Daniela. "Our 30 minute hike up to a hilltop surrounded by vineyards (or drive on top of a pickup truck for some) to enjoy a fabulous picnic and wine tasting. A tour of the vineyard, and explanation of the soil and climate conditions necessary to produce excellent wine. All delivered by the owner and son-in law of a Scotsman." "all visits to the little villages were "wow""
This was our second Rick Steves tour and it was a really wonderful time. We enjoyed the tour, the tour guide, and our fellow group members. This was my first trip to Europe. It was all I hoped for, and more. Daniela is a skilled tour guide who is excited to share with her group. She was enthusiastic and knowledgeable. She took us on the regular excursions and found new locations to share with us. I wish I could request her for all of my future travels. "It was all new and exciting for me. I lived Kaysersberg Castle and the Mer de Glace. I also loved the lifht shoe w at the Catherdral in Reims. There realky is nothing that I was dissapointed with. I also loved the bonus stops at the church amd the olive oil places." Tremendous variety of sights and experiences - a terrific tour. Daniela did a superb job leading it. "The gravity and solemnity of Verdun - Fort Douaumont and the Ossuary and Cemetery. Powerful." "Visiting Mont Blanc. I live in the Pacific Northwest and I thought I had seen mountains but Mont Blanc in Chamonix took my breath away." The group got along better than any tour group I have been with. That was not an accident. And having only 20 people on the trip definitely added to the experience. The tour provided opportunities that I would not have encountered if I had traveled independently using the Rick Steves books. For example, the visits to Chateau de Rully and to Domaine de Mourchon. This being my first Rick Steves tour, I was expecting to just follow the book. It was definitely more than that. "My favorite experience was visiting Domaine de Mourchon. After this visit I had a basic understanding of the process of making French wines. The fact that the owners are British actually helped because I didn't have problems trying to understand a French accent. And it turns out that I can buy Mourchon wines at a wine store nearby in Austin, Texas. The lunch at Mourchon was outstanding. NOTE TO MR STEVES. I encourage you to visit Mourchon and meet Walter." Great people, great food and wonderful, quirky hotels! We loved every minute of it. We enjoyed the villages and towns we visited. Picnic lunch after the tour and wine tasting with the Count at his Chateau was amazing. As was the visit to the Mourchon vineyard in Seguret with lunch. Colmar was as beautiful as advertised. Dining in Burgundy on escargot,Coq au Vin and Boeuf Bourguignon and poached pears was amazing. All of our hotels were in great locations. "The top of the second tram going up towards Mt. Blanc was amazing, steep and scary!" The tour of eastern France was fantastic. Delicious food, great wine, fun travel group, and,Toni, our travel guide was excellent! Loved the variety and unique experiences this trip offered. Being in the different wine regions, learning more about the vinyards, and then tasting the end product was interesting, fun and pleasurable. Loved going from north to south learning about the history and culture as well as the wine. "Loved the French Alps, Mont Blanc, and Chamonix. Great views everywhere and fun to ride the gondolas and cogwheel train. Having fondue was a perfect way to cap a wonderful day. Our bus driver, Paul, did a great job cooking the meat at our end of the table." The tour exceeded my expectations. This was my first tour as I travel with friends. However no one was available for the 3 weeks I wanted to go so I thought I'd take this tour as I've heard nothing but good things about the Rick Steves Tours. I was prepared to poke holes in the experience but I have to say I found none! There were so many things I felt I probably would not have done had a just had a car and gone with friends. We had a great mix of solo and group time! "It was all so diverse and nothing was routine but I'd have to say the clear sunny day at the top of Chaminox Mount Blanc was a total treat! And visiting Vaison la Romaine, a city I'd not heard of. So medieval looking - I loved it!" The trip was simpily amazing. It felt like four tours in one, France, Germany, Italy, and Switzerland. It showcased the influences of the neighboring countries on France, the wine culture, and sites of antiquity. A very broad and manageable range of culture and topics. "The sight of 20 parasailors in the sky as we drove into Chamonix and the Roman theater in Orange. The changing countryside from north to south through the trip." Not being a wine drinker I went on the tour with my wife who is. As a result, I did not expect to have much of a good time but my expectations were way off the mark. It was actually one of the best tours I've been on. This was a great itinerary with a great group and great tour guides. We had wonderful, but hot weather in the south of France. "I would have to say the personal experiences at the wine tasting with Hugo and Kate in Provence was a wonderful experience. I have been to many wineries for tours and tastings in the US and abroad but the explanations provided and passion that Hugo and his family for making wine was apparent. The lunch at their home was also a tremendous experience!" It was a wonderful trip. The hotels and locations were, for the most part, wonderful! Our city guides were all FABULOUS! We loved each and every one of them. Patrick and Linda were great! "Colmar and Chamonix were both big WOW's for us." "The ice cave in the Chamonix"
Touring Eastern France is like getting four countries in one - parts of France seem to be more like Germany, Switzerland and Italy. The variety is amazing, in scenery, culture, food, architecture and history. For wine lovers, this is the holy grail of tours, with vineyard walks and tastings in Alsace, Burgundy and Provence. There's also a hefty dose of Roman ruins and World War I history, so indeed something for everyone. "There were so many, but have to single out the ride to the top of the Alps in Chamonix on a gloriously clear day. The sky was full of parasailers and the mountains full of climbers and the rest of us just stared in awe. We stepped into a glass cube hanging out over the mountaintop, called "Step into the Void" where we looked beneath our feet at the cavernous drop. With Mont Blanc in the distance and elated mountaineers balancing precariously nearby, it was a scene never to be forgotten." I loved the Eastern France tour. The places we stayed, the wine , the food, our group and our guides. "In Chamonix two of us went paragliding which was an unbelievable ride. So beautiful and so fun. A definite Wow moment!!!" Another fantastic Rick Steves tour that helped us learn more about the culture, people, and landscape of France. We especially enjoyed the tours of the vineyards and wine tasting in eastern France. From the champagne region near Reims to the breath-taking views of Mont Blanc to the charm of Colmar, Beaune and Vaison la Romaine, this tour allows time to digest the wonders of France. "We visited the village of Seguret and then drove to the Mourchon winery where we were greeted by Walter the owner. Hugo, a storyteller, explained the winemaking process from growing to producing to bottling to selling. Walter gave samples of these award winning wines. We then enjoyed a gourmet lunch prepared by Walter's wife that was absolutely delicious! A special treat for Rich Steves tour members." This was our first (but not last!) RS Tour. We had a wonderful time and have been telling all of our friends about our experience. The itinerary was perfect. Our guide, Patrick, was knowledgable, helpful, solicitous of our comfort, informative and funny! The special events (wine tastings, meals, tours) were all very enjoyable and well planned. The bus was comfortable and the driver, Eric, was excellent. The pacing was good and we enjoyed the company of our fellow travelers. "the wine tasting at the Chateau Rully"
"Walking inside of a glacier!!! I mean I was actually standing inside of a glacier, incredible... It's a trek to get there but well worth the trip (cog train up the mountain to a gondola down to a platform leading to 480 stairs one way down and then having to do all that in reverse). You can see a glacier from afar but as you get closer you can see how far the glacier has retreated over the years." Our guide Chris and bus driver Hilda were great. There was a nice variety of towns and activities. There was probably more wine tasting than I was interested in. I was glad that there was only one single night stay so we were not packing up every day. As a solo female traveler in her early forties the rest of the tour was 55-75 years of age and few of the couples seemed interested in interacting with me. For my first Rick Steves' tour the group mix took away from the overall experience. Great people. Great leader. Excellent and varied sites. Accommodations and food were good. Breakfasts provided were most often subpar. "I would say the heights above Chamonix. The chateau at Rully was right up there in a different way." "Learning much more about WWI, being at the top of the French Alps and seeing Roman ruins from 2000 years ago." One of the things that keeps drawing me to RS tours is the free time. You get to a place, get the layout then are left alone.I bring back between 4-6000 shots. I then create videos which I post on my Youtube site. Getting off the beaten path is what I like. "Climbing the stairs of the Roman Amphitheaters. Walking inside a glacier going up a cable car to the top of the mountain, something I never thought I would do. Standing in front of some of the greatest achievements in art that humankind has created." Eastern France is a wonderful tour, our 4th great experience with R.S. No crowds, gorgeous scenery and locales, unique side trips, small cities and towns w/o the bustle of bigger more touristy sites, an amazing guide and great bus driver. I learned so much about the history, wines and foods of the regions we visited and enjoyed interacting when on our own with the local residents in each area, all of whom were kind & patient with my very shaky French. "Only one? I actually had several. The gondola rides into the heights of the Alps in Chamonix of course. Our wonderful day at Domaine Mourchon- meeting the lovely family that hosted us, the vineyard and winery tour and the spectacular lunch they provided at their picture postcard home. The market in Beaune, was a wow too. The boat ride on Lac d' Annecy." Wonderful trip...Chris is a super guide and interpreter of the language,and customs of France. Full of excitement for the food and wine. But most importantly watching that everyone is learning and having a great time. The group was wonderful and helpful to each other. "Cable ride in up "Mont Blanc" in Chamonix LUNCH AT DOMAINE DE MOURCHON!!!!" WOW - France is amazing. This was our 3rd time to go to France (2 other RS tours), and we loved this one. We had a very congenial group of 23 and we all got along great. Everyone was always on time! I loved the variety of places we went...from the champagne country, Alsace, French Alps, and Provence area. This was our 7th RS tour and it was absolutely the best weather we've ever had. I thought there was a really good amount of free time to allow us to explore on our own. "Well, I have a few! I can't pick just one. 1. Chateau du Rully - I loved our tour of this chateau built in the 1100's, the wine tasting, and the wonderful picnic on the grounds provided by our RS guide. 2. The Koenigsbourg Castle 3. Mourchon winery - tour of vineyards, wine tasting, and the fabulous lunch at the owner's home out in the yard. It was magical! 4. Discovering the old town of Vaison la Romaine on our own. The ultimate French village. 5. The Hospice in Beaune"
The diversity provided on this tour in scenery, history, food, wine etc. was wonderful. Our group was so friendly, interesting and kind, as was our tour guide, who I will talk positively about later (! ), and our bus driver, Hilda. Bravo to Rick Steves and his employees for organizing and providing such wonderful experiences! "It is hard to nail down one 'wow' moment because of the tour's variety....going from the north to the south of France. I would say the tour of the WWI living areas, along with seeing the hallowed grounds and the memorial was one that made an impact on us. Maybe our Mourchon wine tour, tasting and wonderful lunch that the family served us in their yard was a day we won't soon forget. What wonderful people, who are so passionate about what they do." Our eastern France tour was our fourth Rick Steve's tour and like our previous tours it was outstanding. We hoped that it would be less "touristy" with fewer crowds and it did not disappoint. The local guides were good and the local tours were very unique and interesting. The wine tastings, picnics, walking tours, boat ride, etc were well planned and very enjoyable. The group dinners were not as good as our previous tours but were still pleasant events. Overall a great tour!! "There were many wonderful moments but riding the two trams to the top in Chamonix on a clear day. What a view!" This was my 7th Rick Steve's tour. Again, it was an outstanding experience. The combination of the itinerary, great guide, and group camaraderie made for a memorable experience that I'll cherish. "Chamonix: walking along the main street in the valley while looking up to the peaks of the French Alps; riding the telepherique up to Aiguille du Midi, seeing the valley below, then looking up feeling you could reach out and touch Mont Blanc. Stepping out of the cog-wheeled train in Montenvers and seeing the amazing Mer du Glace glacier. "sublime wow":hillside vineyard tour & walk in Alsace with local guide Jean-Claude. Beautiful views & included a portion of Camino Santiago." Every day was excellent! I loved the quaint villages we visited, the wine tasting, the luncheon at the winery, the picnic at the castle, the group dinners, and all the other places we visited. Our tour guide, Patrick was exceptional! We saw so many interesting places each day. We learned so much about the history, the culture, the architecture and more. The countryside was beautiful. The bus rides were relaxing and interesting. Our bus driver was really good too! "The scenic town of Chamonix with the steep French Alps in the background. Also the medieval and Roman parts of Vaison La Romaine and the charming town of Seguret; both had so much character!" An outstanding group of companions, we had a wonderful time together. Almost all were veteran travelers, lots of good stories and plenty of laughs. Patrick Vidal is a superb guide: knowledgeable, humorous, engaging, tirelessly cheerful and patient. The only disappointment was the food, an odd thing to say about France. The food was very good for the most part, but rarely outstanding. Maybe we are spoiled by the high quality of restaurants in Seattle these days, but I think it is more than that. "The view from the top of the gondola at Chamonix." This was our fifth RS tour, and I have to say it was my least favorite. Not because of the guide, of course. Patrick is fantastic!! I think it was the itinerary that I found to be less interesting than prior trips, and the hotels and meals did not meet our RS expectations. I would have preferred to stay in Anacee and/or Keyserberg longer, and perhaps skipped Aix-en-Provence. On prior trips the last stop always provided a Wow finish. Not true on this trip. Overall the tour was very good. Beautiful sights and good wine. We have taken many RS tours, and each one always seems to surpass our previous experience. We enjoy the unique mix of "guided tour" time and free time to explore on our own, and we learn so much more on RS tours than we ever could on our own. This tour was no exception. Our guide, as always, was excellent, giving us a wonderful new perspective of the French culture. And what a great group of compatible tour members! This tour far exceeded our expectations. "One had to be Chamonix, and seeing the views of Mont Blanc and the surrounding snowy Alps after stepping off the gondola at nearly 13,000 ft. To us flat-landers, it was totally amazing, on a sunny and clear blue-sky day with gorgeous scenic views. Another was the Cotes du Rhone region, where the winery owners treated our group to a lovely picnic lunch under their Linden shade trees, overlooking the vineyards, after a wine tasting and tour of the winery. Beautiful!" Every day of the tour was well thought out, the overall experience was very enjoyable and rewarding. "I found the gondola ride and the stunning views at Chamonix the top site, and the 2nd best experience was the wine tasting in the Côtes du Rhône area." It was our 5th RS tour and a wonderful experience. It was a bit different than past tours in that there was more eating and drinking and somewhat less visits to churches, ruins, etc. Included dinners were some of the best of all our tours. We have always wanted to visit the famous wine regions of France and this tour certainly met all of our expectations. "2 wine related activities- the first was a visit to the Count's chateau in Burgundy, including a personal tour and wine tasting of his own wines grown in his "front yard". The second was a tour of the winery in Provence including an incredible lunch prepared by the winery owner's wife. ok perhaps a 3rd "wow"- the indescribable light show projected onto the cathedral in Rheims." Fabulous trip - history and stunning beauty around every turn, food and wine made by people with a passion for their craft, valuable insight into the French culture, and lovely inquisitive fellow travelers. We loved it all! The pace of this trip allowed for a deep appreciation of the cultural nuances of the French culture - there was time to linger over food and wine and to build relationships. "I was awed by Chamonix. It was the perfect to use this city as our 'vacation from our vacation' because the physical beauty required some private time to process. I took the cog train to take in the majesty of the mountains and just loved it all. The city of Colmar was unique and beautiful. Also, the tour of the winery and lunch in the home garden of the wine makers was stunning, delicious. The French culture was alive and well in that moment." Very nice and quality tour with great companions. No one late, rude or strange. We were so pleased to have such pleasant companions! Tour well laid out, as usual. "Chamonix mountains views from ANYWHERE were awesome! Vineyard at Cotes Du Rhone with Kate and Hugo was WONDERFUL! Aix-en-Provence was nice wrap up especially the Markets and the Apple Store. It felt like we were in the modern France city of today, fountains and all! I could live there." A truly wonderful tour of wineries, history and French culture. "Out tour and lunch at Mourchon winery!" Toni was an excellent guide. I loved the variety of cities/villages we either stayed in or stopped for a day visit. It was great. Just like the other two I've been on. I especially liked meeting "The Count" and "Hugo" and his wine making family. "The video/sound show at Notre Dame in Reins." Excellent tour, great [INVALID]ion of places to visit. Loved the variety of cities and towns, and differing landscapes, rolling hills in Alsace and gorgeous Alps. Being in Reims on V-E Day in the room where WWII surrender papers were signed immediately after the French Presidential election, then visiting WWI battlefield of Verdun was poignant. Loved the walks through vineyards and getting feel of the French people. Enjoyed finding the Salvadore Dali musee in Beaunne. Mourchon winery was fab! "I visited Cezanne's studio on free time, then walked up the hill to where he had painted. Halfway up the flagstone stairs, I stopped to sit and enjoy the view, turned around. It took my breath away. Mt Sainte Victoire, which is featured in over 80 of Cezanne's paintings stood before me, and I teared up. WOW!" I have enjoyed this tour. The travel mates were wonderful, friendly, considerate and a joy to be experiencing Eastern France with. Our guide, Toni Seymour was a gem. The dining experiences with French food and local wines were fun and educational. The overall experience with this tour was excellent. "I loved the stay at Chamonix and the view from the top of the mountain was definitely a 'wow' moment for me." This was our fifth Rick Steves Tour and all have been terrific in regards to the tour guides and content. The quality and/or locations of a few hotels continues to be an issue that needs to be addressed. While it's extremely desirable to be in town, close to where the local population lives and works, the selection criteria should also include night-time street noise, bed comfort and internet access performance. "There were several completely different "wow" moments which defy choosing as the one favorite. How does one choose between significant history, architecture, wineries/wines, Saturday Markets and great people to people experiences?" 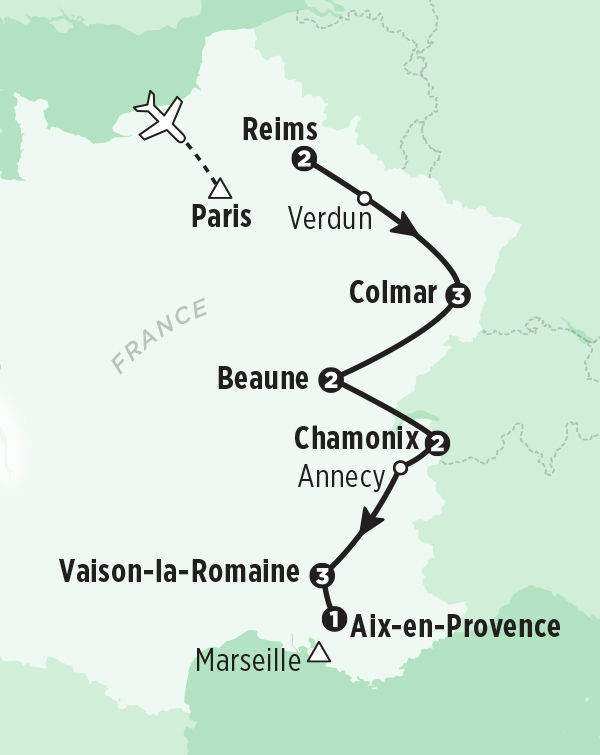 Most tour members arrange to fly into Paris and out of Marseille ("multicity" on flight-booking websites). Paris is a 45-minute train ride from Reims where the tour begins, and the Marseille airport is a 30-minute bus ride from Aix-en-Provence where the tour ends. Booking round-trip to one city will require a connecting flight, train trip, or additional overnight stay in France. We suggest arriving a day or two before your tour begins to allow ample time to get over jet lag and be well-rested for the first few days of your tour. For more information about transportation options for getting to and from your tour, see your Rick Steves France guidebook. This is a fairly active tour! Most days are light to moderately paced with 2–6 miles of walking, including some hills and stairs.